This paper presents the experimental work devoted to electron microscopy study of pathomorphological changes in nerve fibers under the influence of Paclitaxel. This antitumor drug was administered to random bred rats intraperitoneally at a dose of 2 mg/kg 4 times every other day. Sciatic nerves sampling of animals was taken on certain days during 120 days of experiment. 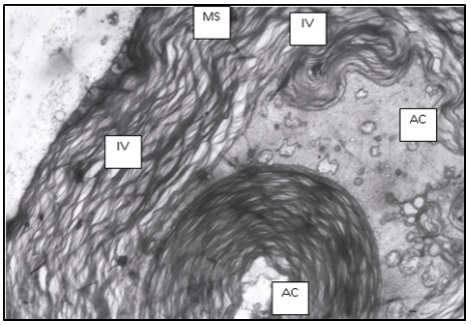 The following ultrastructural changes of myelinated nerve fibers have been identified: hypertrophy and myelin sheath delamination resulting in formation of interlamellar vacuoles; swelling and atrophy of axial cylinders with diffuse distribution of neurotubules; cristae diffluence; homogenization and vacuolic transformation of mitochondrial matrix; complete nerve conductors degeneration and remyelination. Fig. : Formation of the small intramyelin vacuoles (IV), disruption of mitochondria architecture and formation of multivacuolar structures in axoplasm on the 1st day of experiment. Electron micrograph. Magnification: х9600. Designation: MS – myelin sheath, AC – axial cylinder. Gevka Olga. Electron microscopic changes of sciatic nerves in rats with experimental peripheral neuropathy caused by paclitaxel.. 2014; 3(1): 36-48.